Double Olympic medallist Hayden Roulston has signed with a yet-to-be-named Pro Tour team in Europe for next season. Roulston was part of the now-defunct HTC Highroad team which failed to find a financial backer for next year despite recording nearly 500 wins over the past four years. "I just signed my contract [yesterday] morning. I'll be based overseas again," Roulston said. "The team will release that over the next week, I think." "It's going to fit in well, they've okayed everything regarding the track. "For me, it's basically the best of both worlds." The demise of his former team had come as a blow, Roulston said. "The biggest team in the world, and then all of a sudden they just stop was a kick in the guts for the riders and the fans and the sponsors," he said. "It's just cycling at the moment and it's just the environment that we live in." Although Roulston has been focused on his career on the road, it's his short-term future on the track which has been in the front of his mind since rejoining the New Zealand elite track team for an important camp in Invercargill this week. Roulston's road commitments have ruled him out of contention for the New Zealand team since winning Olympic silver in the individual pursuit and bronze with the teams pursuit in Beijing in 2008. Returning to the track this week had not been easy. "It's been a misery, it's been hard," Roulston said. "It's been 3 1/2 years since I did an individual pursuit so I didn't expect to be going really well but there's still that part of you that wishes you were going better. "It's all one step on the way to London next year, it's an important phase. "I don't think it ever leaves you, I just think it takes a while for your body to realise that sort of feeling and that pain again." Roulston, who fought out an exciting points race with Aaron Gate and Marc Ryan before eventually finishing second to Ryan on the opening night of the national omnium championship last night, said his ambition was still to win gold on the track at the London Olympics. It was something that was reinforced when he returned to Beijing for a road tour earlier this month. "It's was just a wee reminder of the job which still hasn't been done and the job that I want to achieve," Roulston said. Jo Kiesanowski dominated the opening day of the women's omnium, winning the flying lap and points races, and then taking out the elimination race before being demoted to third by the officials after the race had been interrupted by a puncture. Gemma Dudley sits tied on five points, but is second overall, with Elizabeth Steel third on eight points at the halfway mark. Aaron Gate, who claimed three third-placed finishes last night, holds a narrow lead in the men's omnium on nine points from Cameron Karwowski (10), Marc Ryan (12) and Roulston (13). 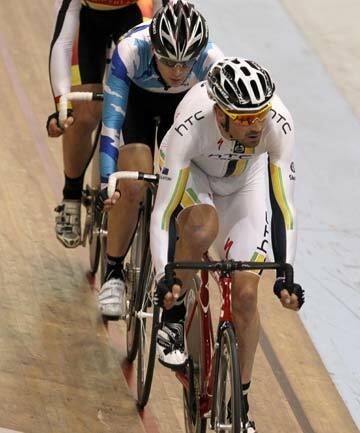 The championship and the ILT junior carnival finish at the ILT Velodrome tonight.